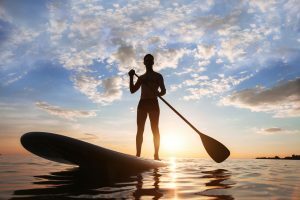 Paddling is a nice outdoor activity that can be enjoyed by anyone. 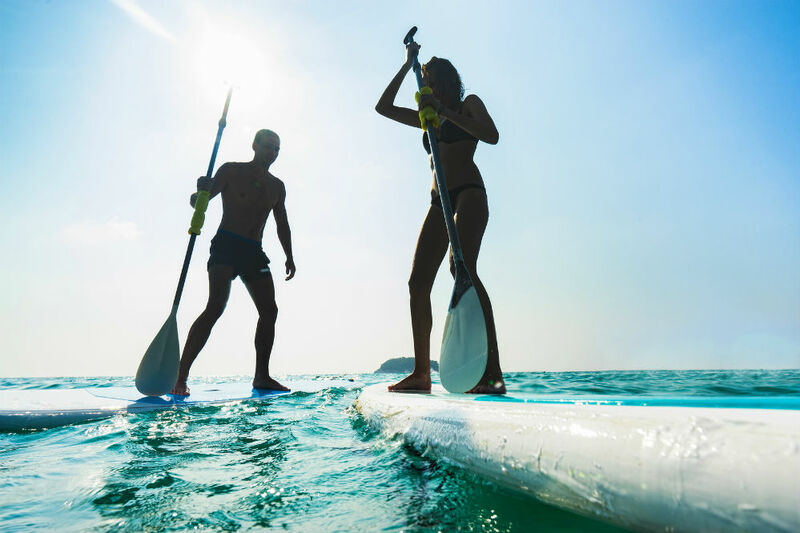 Blue Wave Sports Stingray Paddle board is an inflatable that is versatile and easy to maneuver; it definitely comes with all that you may need. The board has some remarkable features that will definitely thrill you such as a multifunctional blade, anti-slip deck and D-rings. When inflated it measures up to 10 feet long. On width measurements, it measures up to 30 inches and with a thickness of 4 inches. For durability, it has a double-layered outer skin. 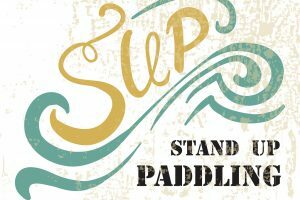 This makes the paddle board tough and gives it the ability to withstand any form of dings and abrasions. Its core has been constructed using drop stitched high pressure. This makes the paddle durable and indestructible. Has a multi-functional blade that can be used for canoe paddling, long paddling and kayaking. It features D rings and bungee cord to make it easy to store any accessories when on board. An anti-slip deck pad made from Z Ray – Soft Grip Technology. This provides great grip, comfort and control. Other accessories that come with it include a paddle, an adjustable fabric seat, a hand pump with a gauge, crew valve, hand wrench, tear resistant backpack, foot rest, a repair kit and a removable center fin. Easy to store. It can be inflated, used, deflated, rolled up and then stored inside its backpack. 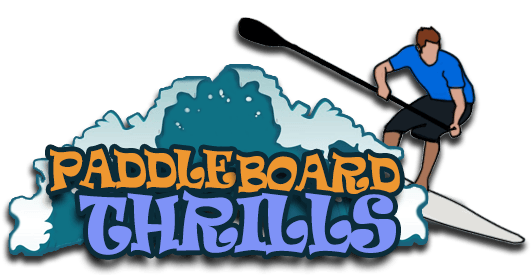 It is a versatile board, with a versatile paddle that can be used for canoeing, long paddling and even kayaking. Once fully inflated to the right level it is firmer and with more stability. You can carry your stuff on it thanks to the D-rings and bungee cord. It is versatile and can be configured for different activities such as kayaking. Some users have said that the instructions that come with it are not that clear. 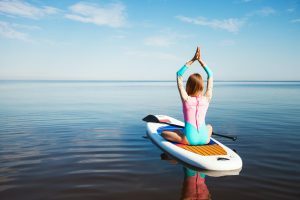 This makes it difficult for first-time users who think that they have bought a faulty paddle board. It is only after trying out several ways that they are then able to fix it properly. Before you attain the required inflation size, it takes a lot of energy and time. If you do not do it properly then you will waste much time trying to inflate it. This is a good paddle board that you should definitely purchase. 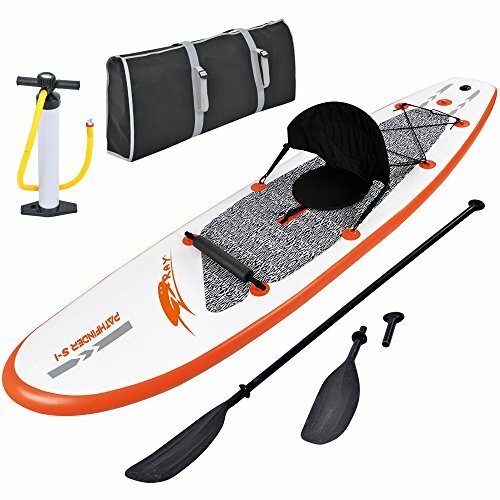 Its versatility makes it a good paddle board which you can even use for kayaking. It offers great comfort and stability when in use. The stainless steel D rings and the bungee cord offer adequate storage space for its accessories. The materials used make it durable enough to prevent wet conditions inside the paddle core. It is also very stable. This paddle board comes in two colors: orange and white. It does not come cheap, but it is worth the purchase. 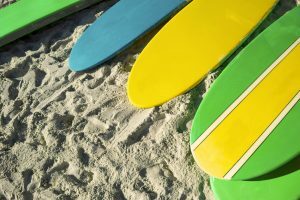 For comparison purposes, we will compare Blue Wave Sports Stingray Paddle Board with other available paddle board models. 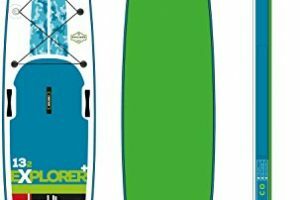 These include Atoll’s Flagship IUP Cruiser Deluxe and Slingshot Standup Paddle board 2016 Crossbreed Aristech. Atoll Flagship IUP Cruiser Deluxe. First up is the Atoll’s Flagship IUP Cruiser Deluxe. It measures 11 feet long, 32 inches wide and 6 inches thick. It has an inbuilt H3 valve. 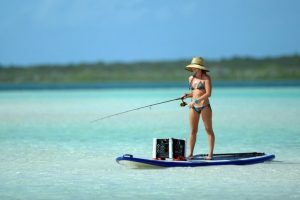 It comes with a couple of state of the art features such as a dual action hand pump, nylon blade, 3-piece paddle and detachable and airtight fin for stability. Its surface is well wrapped with a two layer patented material that covers both the top deck and bottom deck. This makes the paddleboard stiff and rigid which is thanks to the Korean style drop stitching technology. 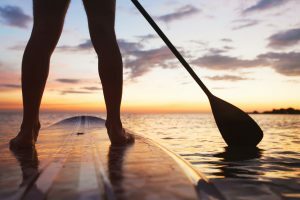 Its thickness makes it virtually impossible for water to get on the paddle board. In addition, the top deck surface is further wrapped up with EVA foam on the surface that prevents slipping and loss of balance. To further cushion you from unnecessary repair costs, it comes with a 2-year warranty. However, it costs more. The Slingshot Standup Paddle board 2016 Crossbreed Aristech is also another paddle model available on the market. It is lightweight, something that makes it easy to handle and quick to set up. The material used makes it impact resistant from dings, abrasion and denting. Tony Logosz does the shape and design for this model and it is simple and flawless, making it easy to maneuver. In terms of speed, it does the job just fine. You can get one for yourself, but you will have to part with lots of cash. The Blue Wave Sports Stingray Paddle Board is a good purchase any day. The Z ray technology it is built from makes it non-slippery and with great stability. It also has a multi-functional paddle that can also be used for long paddling, canoeing and kayaking. In terms of pricing, it beats the others, as it is cheap. Hit the stores and get one for yourself. It is definitely a good buy and you will enjoy it a lot.